... I believe that my family and friends now know what to get me for Xmas. I've long been a fan of Winsor McCay, one of the most acomplished cartoonists of the early 20th century and a pioneer in animation, to boot. I'm so much of a fan, in fact, that one chapter of my dissertation dealt specifically with McCay. 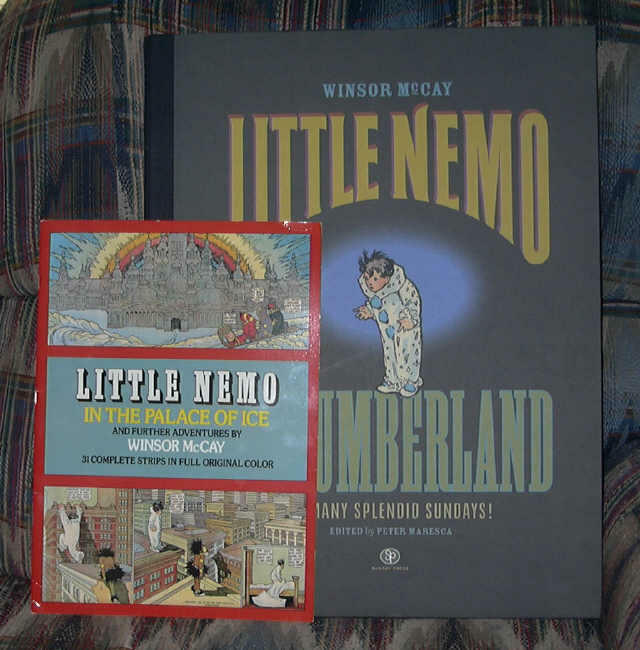 "Little Nemo in Slumberland," undoubtedly his best-known comic strip work, has been hailed by readers and critics for decades, leading to several reprintings . 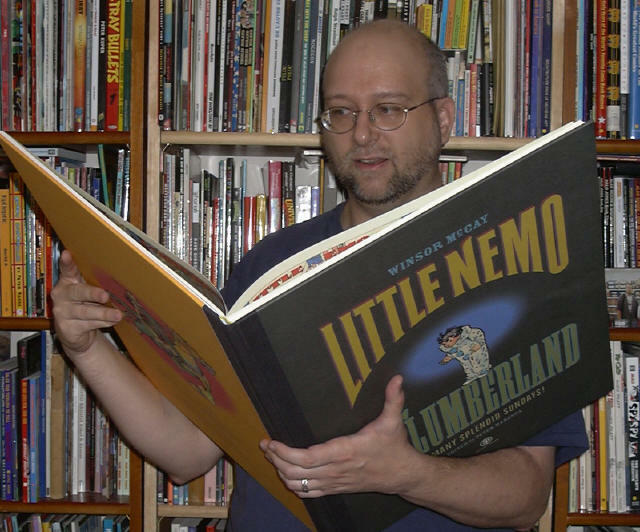 But none of these collections, no matter how carefully selected or produced they might be, have managed fully to convey one of the most impressive aspects of the comic: McCay's exploitation of the entire newspaper page to produce both stunning, expansive vistas and delicate, detailed miniature images - often on the same page. Until now. But it's the careful attention paid to the comics themselves that really recommends this book. Each strip has been digitally "remastered," if you will, from original newspaper tearsheets, all with the intent of reproducing for us moderns the experience of reading these strips as they originally appeared 100 years ago. The effort has paid off handsomely, to say the very least. I've read all of the strips here before, some of them literally dozens of times; but seeing them again in this book was like discovering brand-new territory, an oasis in a desert you'd never before realized you inhabited. To be able to linger over these images, absorbing all of the minute details in the drawing and the often amazing subtleties of the coloring, is a luxury I'd never dreamed of. I can't begin to comprehend all of the technical issues Maresca had to confront to produce such an exquisite volume; but whatever he went through, it was more than worth it. And I'm far from alone in my opinion; be sure to read these testimonials as well. 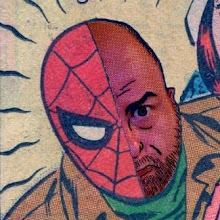 Fans of comic art the world over owe him a debt of gratitude which none of us can ever repay individually. A book this significant belongs in every library in the land. 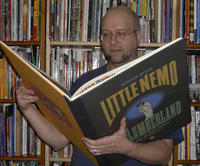 (Perhaps libraries have shelves large enough to hold the book - I don't!) If you're a bit strapped for cash but want to experience this book (and you know you do), beg, urge, cajole, pester, or otherwise convince your library to order a copy. You'll thank them, you'll thank yourself, and readers with exquisite taste will thank the library for at least another 100 years. Oh, and while you're at it, be sure to pick up one of the spiffy 2005-2006 15-month calendars for yourself. One last thought: I've included "Little Nemo" in many of the courses I've taught over the years. 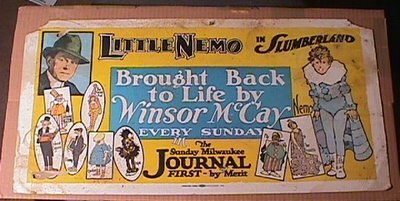 After explaining to my students that the original printed pages were about twice the size of the Dover edition, I've confessed that I truly envied the strip's original readers - especially the kids of, say, six years old - who had the privilege to almost literally "fall into" Nemo's world, who could have their entire field of vision filled with McCay's imagination. 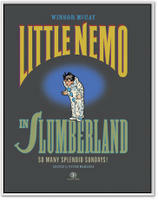 Today, reading Little Nemo: So Many Splendid Sundays, I finally felt like I was six years old. Update, 22 September: Parts of this review are now posted at the Sunday Press website, under "testimonials". Wow, great company to be in!